Sample some Christmas cheer with this holiday-themed boxed set! Celebrate the holidays with a cowboy, a princess and a small-town single father as each finds their hearts’ desires in these stand-alone books. The trees, the lights, the gifts, the music, the magic of the season all come to life in Wyoming Wildflowers: The Beginning (Wyoming Wildflowers series, Book 1), The Christmas Princess (The Wedding Series, Book 5), and Falling for Her (Seasons in a Small Town, Book 3). While each story can be read alone, you can enjoy more love stories in the series they’re part of. 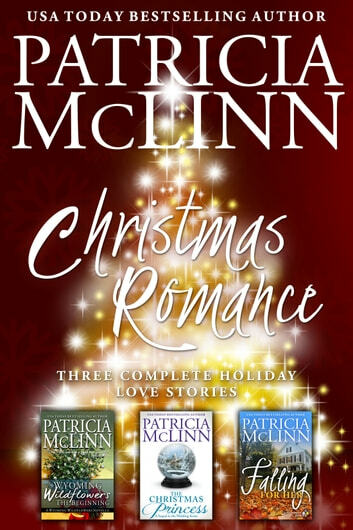 Christmas Romance: Three Complete Holiday Love Stories is USA Today bestselling author Patricia McLinn's collection of moving, passionate, charming contemporary romances that will captivate fans of RaeAnne Thayne, Barbara Freethy and Debbie Macomber. The coming Christmas season isn’t looking great for April Gareaux. Her job is uninspiring, her engagement is off, and she has nowhere to live. Then comes an extraordinary offer – spend the holidays in Washington with King Jozef of Bariavak as his possible long-lost granddaughter. Even more extraordinary is the man behind the offer and the one who will be beside her through the coming weeks, Hunter Pierce, a stoic State Department agent with secrets of his own. King Jozef has known tragedy in his life. As this lovely young woman brings joy to his holidays, he can't resist some royal matchmaking. High school principal Josh Kincannon has his hands full as a single father of three, and dating is mostly a misty memory. Then he meets tech executive Vanessa Irish, finding her conscientious and intelligent, but distant and distracted. As his curiosity deepens, so does his attraction to her. Numbers, that's where Vanessa is comfortable. Not all this interaction with people, especially Josh. Why does he insist on drawing her into his small town, his life, his children? And the biggest question -- what kind of man is this, who not only looks at her, but SEES her, when that's the last thing she wants? ”Nothing short of heart consuming and thrilling."